The weather continues to be dreadful worldwide (more snow and rain, anyone? 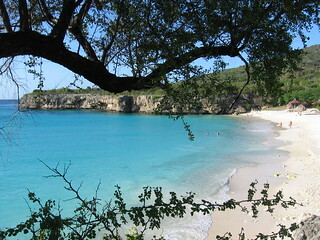 ), so here at Sunshine we’ll continue to fight for our right to some sunshine with today’s hot spotlight: Curaçao. It’s a neighbour and alternative to our previous popular spotlight, Aruba. Just a hop skip and jump from the coast of Venezuela, these islands have the best of both worlds – the continent of South America seems to buffer them from hurricane storms, and this location sits on the path of trade winds, so a nice breeze is ever present to cool you off in the heat. All you need to see is one photo of Curaçao and you’ll be ready to pack your suitcase. But what to do while you’re there? A few highlights. If you’re not one for spending the entire week on the beach, then Curacao might be a great choice for you, because you can spend every afternoon in a different one of the waterfront cafes, enjoying the colourful view of these pretty houses that fill the centre of town. As the largest and most populous of the three islands in this area, you definitely can get more of an urban city feel, which might not be why you came here but I think it is nice to have when you get tired of your chaise lounger or get sunburnt and need a break! There are also a handful of museums that might float your boat, though I wouldn’t rush to hit the exhibition. 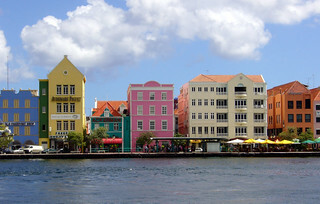 Both in the main town Willemstad, there’s the Kura Hulanda, which has some information about the African slaves and the Curacao cultures. There’s also a Maritime Museum for those into boating. Worth checking their websites to see if any special features will be up while you’re in town. There’s so much outdoors-y stuff going on in Curacao that it’s hard to hit it all – hiking, snorkeling, beaches, and other attractions can keep you busy (in that relaxed, Caribbean “busy” way) for a week or more. First port of call is the Carmabi Foundation. They are a biodiversity research foundation and they run a whole array of national parks, marine parks, wildlife tours, and other interesting things around the island. What’s nice, is they are also making sure things are kept in good condition and sustainable. It’s a win-win. There are also over 40 different hiking trains on the island. You can take a guide or just hop on a trail yourself – the hotels all have maps and tips for how to get there (depends on what part of town you are staying in). Don’t forget a hat, sun cream, and water – in this Caribbean heat, near the equator, you are very easily susceptible to heat stroke, more so than if just relaxing in your beach chair. And of course, that’s an easy peasy option too. The island’s beaches are mostly on the south coast, with varying amounts of amenities, partying, and water sports activities. I suggest you stay with a hotel that has beach access (either directly or an easy walk), and then decide how you feel about exploring further, since really many beaches have the same options for activities. Chicken Sate – this island must go through barrels of sate and peanut sauce every day. Delicious! Let’s just say, you won’t be bored or hungry in Curacao.